Announcements: The morning began with a prayer from Perumal Vivekandan, from SEVA in India. Joao Sales da Rosa, from Amazon Link followed the prayer with a song prepared for the time of harvest. Esther welcomed everyone to the second week of the community Taba and briefly reviewed the events of the first week. Because there were many new faces in the Taba, the microphone was passed around so that people could introduce themselves, and as well as their country of origin and their organizational affiliation. Livingston gave a brief summary of the field trip to Cananeia Oyster Cooperative. The group was ferried to a point where they were given a background on oyster harvesting techniques. From there, Taba participants were introduced to the local community that was managing oyster production in the mangroves and the women's organization doing other types of work (i.e. sewing etc.). Livingston reported that he was pleased with the experience and suggested that we learn by seeing and through common experience. Knowledge Day: Donato provided some background to the theme of the day and outlined the plan of action. He requested everyone to visualize the knowledge and capabilities they have at home, within their local communities. What is our common understanding of why it is so important to share knowledge? What are the methods we have for sharing knowledge? How do we bridge this with partners and policy-makers? What are some of the networks we have? Considered together, these questions, and the discussions that ensued, could help us inform a plan of action for a knowledge-sharing mechanism. Joao Sales da Rosa, from Amazon Link, was the first presenter of the day. Joao is from the Pentenau region in Brazil, spoke about the access of indigenous Brazilians to telecommunications technology and knowledge. Networking indigenous Brazilians was a great challenge, in part because many people think that indigenous groups do not, or cannot, have access to technology and knowledge. However, even in the absence of modern technology, indigenous peoples have access to a wealth of traditional knowledge and skills. Thus, there needs to be mechanism in place that preserves the right of the indigenous peoples to retain their traditional knowledge. However, some multi-national companies and other stakeholders view indigenous knowledge as a means to make money, without regard to the rights of the local indigenous peoples. As a result, multi-nationals sometimes want to buy the knowledge from the people, but this is not a value system in which the indigenous people work. In 2003, the UN promoted a discussion about information access across societies. During the course of these discussions, indigenous groups were identified as a group that had the least access to information and technology. 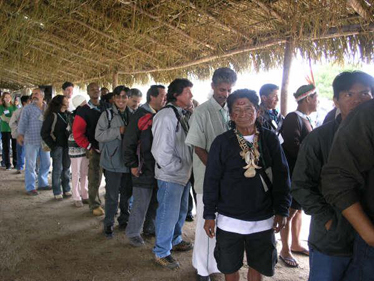 Soon thereafter, the Brazilian Indians started the started the Indigenous Peoples Network which connects indigenous Indians with technology. Although the Secretary General of the UN for Communications was initially skeptical of the idea of including Indians in the debate on telecommunications, a grant from the Bill and Melinda Gates foundation facilitated Indian access to technology. Communication, without information (such as is prevalent in the age of cellular phones) is simply consumption. However, it is just as important to recognize how technology is changing communication, and how the indigenous peoples can have their voice heard among the vast array of information outlets. In general, the Brazilian media has not championed the cause of the indigenous people. Only local groups tend to grant the Indians a platform. There are over 9 million hectares in the Amazon basin. In order to protect the land, a monitoring system was set up over the internet. The technology necessary to do this was fairly simple, and required only a few computers. However, training was necessary in order to ensure maximum benefits. The program coordinated by the Amazonians takes advantages of the vast amount of on the ground experience, and merges it with technology. Even though much of the information necessary for to operate the computers and monitor Amazonian lands could be found on the internet, the Indians recognized a need to develop their capacity to access and utilize this information. Nonetheless, even with the capacity for monitoring and operations, important questions remain. For example, should it be the Indians’ function to disseminate, or collect information about the protection of the Amazon? These debates are ongoing in the local community. Because multi-nationals are buying up Amazonian land, they can control the resource and limit access to indigenous groups. Thus, it is especially important to learn how to access and use information to protect indigenous land, resources, culture etc. The speaker closed by suggesting that indigenous communities need to know how to "close the faucet" of information, so that the interests of indigenous peoples, and not the market, are ultimately served. Furthermore, the speaker emphasized that communication is serious work, and that indigenous peoples must maintain their belief in traditional knowledge systems, but must also be open to accessing and utilizing new sources of information. Following the presentation, Esther reiterated the importance of community access to traditional and contemporary knowledge networks. In addition, Esther emphasized the importance of taking advantage of existing media outlets that are willing to provide a platform for indigenous voices, or are interested in local and indigenous stories. Several Taba participants had comments or questions for the speaker following his presentation. First, one participant reminded the audience that the battle for access to and control of information is not unique to indigenous peoples, but is a common experience in many communities. Another participant thanked the speaker for reminding the audience the importance of owning their voice and speaking up for themselves. A Brazilian participant noted the importance of effectively and accurately demarcating indigenous lands to the conservation of biodiversity. Such delineations would afford indigenous societies some level of protection against invasion by lumber companies, fishing companies, etc. The Pacific Island contingent mentioned that despite the constraints of language barriers and cultural barriers, Pacific Islanders have come to know common issues through group meetings. Four major organizations have been created by Pacific indigenous peoples, and members of these organizations can effectively transfer and exchange ideas. In addition, these networks enable Pacific Islander representation in the WHO, UN, etc. The discussant also mentioned that these networks were created in the absence of modern technologies, and that technology only comes onto the islands via a deliberate invitation. Such invitations are extended when the technology is able to work within the culture and ways of the Islanders. Because this systems works well in the Pacific, the discussant suggested that perhaps the Brazilians might find a way to more effectively network among themselves. Esther agreed with the Islanders, that face to face communication cannot be replaced by telecommunications, computers etc. A representative from the Traditional Indigenous Network stated that it is of paramount importance that communication systems do not neutralize indigenous identities. Although globalization isn’t good for the Indians, it is important for indigenous Brazilians to be realistic. The representative stated that indigenous peoples are at great risk of being incorporated into corporate systems. The representative suggested that modern globalization is akin to a colonial system, and that it is impossible for Indians to remain truly isolated in the face of globalization. The representative mentioned Google Earth, and how knowledge of mapping and Amazonian territories is no longer solely dependent upon indigenous knowledge. Thus, indigenous people must understand how modern technologies benefits their land and strengthens their identities. The second presenter of the day was Perumal Vivekandan from SEVA in India. His presentation focused on the traditional knowledge and innovations that have come out of Asian-Indian communities. Traditional knowledge can be thought of as the ancient knowledge of a particular culture, and thus dates back for many centuries. Indigenous knowledge, on the other hand, is more contemporary. Innovation can be thought of as the source of knowledge. In India, they are documenting indigenous knowledge and Indian-generated technologies. By facilitating cross-cultural learning exchanges and publishing these technologies and innovations in six local languages, it is hoped that sustainability can be achieved. These innovation exchanges are supported, in part, by what is known as the honeybee network. The honeybee network is so-named because it aims to transfer green technologies from community to community, much like a honeybee transfers pollen among flowers. There are many examples of indigenous technologies that have been developed (and publicized, via the honeybee network). These include: the cotton stripper machine, a palm and coconut mat-weaving machine, a coconut tree climber, a bullock cart, the bicycle hoe, a groundnut separator, a garlic peeling and lemon cutting machine and a UV ray protection umbrella. In addition to these mechanical innovations, indigenous Indians have also been responsible for developing a number of different types of agricultural varieties. These include novel varieties of rice, pigeon pea, cauliflower, nutmeg and cotton. Innovations to agricultural technologies include novel methods of cultivation, irrigation methods and organic pest control. Given the breadth of local innovations, such as those mentioned above, the National Innovation Foundation (NIF) was formed. This foundation utilizes an award system to gather information and recognize community innovations. Furthermore, the foundation aims to protect the intellectual property rights and indigenous knowledge of the innovators. Publications that detail these innovations are printed in six languages every three months. Quarterly meetings and annual workshops further support the mission of NIF. In the future, they are looking to expand their programs into local school curriculums, as well as into other nations. One participant wanted to know whether the NIF is involved in the protection of the rights of the innovators. The presenter stated that innovators can apply for patents for the innovation. However, the process is still being perfected. A Brazilian participant asked about the availability of printed materials in Portuguese. His group works with medicinal herbs, and they are interested in establishing contact and exchanging information. The presenter stated that he would provide contact information, and that the Brazilian could work towards setting up a network for knowledge exchange. A third participant wanted to know whether the hybrid agricultural varieties posed a threat to indigenous species? The presenter suggested that cultivation of agricultural varieties and conservation of indigenous plants are two complementary goals. Knowledge of hybrid palnt varieties may be used to conserve native plants. This group cited several examples of knowledge sharing programs in which they have participated, including the Community Taba. Religious ceremonies were mentioned as a way for elders to share information and knowledge with the younger generation. Such ceremonies also help to spread information from one community to another. Personal communication, on a more intimate basis and in larger community encounters, was also mentioned as successful ways to transmit knowledge. Finally, a few participants noted that this was the first time they have come to share knowledge in an international dialogue space. This group also provided examples of challenges and barriers to knowledge exchange. These challenges include a lack of funds and resources, an absence of established networks for exchanges, the physical distance between communities that might want to engage in a knowledge exchange, and a lack of technological infrastructure to support and document such exchanges. Group 4 noted the importance of communities being able to meet each other, communicate with one another, and conducting workshops on specific issues In addition, the importance of producing and exchanging end products, in addition to knowledge and information, was also noted. The potential benefits of competition among communities, in terms of improving the quality of end products was mentioned, as was the potential conflict between industry and the environment. Group 3 was a diverse group, and included participants from Peru, Argentina, Fiji, Brazil and the USA. Despite their diverse backgrounds and experiences, the group members agreed that traditional knowledge could be defined as that information which is passed from older generations to younger generations. Thus, this group stressed the importance of identifying the leaders and heads of communities, who are the keepers of traditional knowledge. Incentives were mentioned as one way that might encourage elders to come forward to pass down on their traditional knowledge to the younger generation. Because story-telling is one of the best ways to pass on knowledge, potential difficulties associated with language barriers were noted. Similarities and differences between traditional knowledge and scientific knowledge were mentioned, as was the importance of local communities having an understanding of the application of scientific knowledge towards local issues. Finally, it was suggested that efforts must be made to lessen the gap between science and community knowledge. Group one began the break out discussion by considering the definition of and the origin of knowledge within communities. It was decided that knowledge consists of those ideas that are obtained in any space, that helps local communities to implement their own projects. Furthermore, knowledge sharing requires a recipient and a donor, such that an ideas can be removed and applied to another project. The need to integrate traditional with scientific knowledge was also mentioned in this group, and an example was provided to illustrate the disconnect between the two forms of knowledge. However, just as scientific knowledge has little value in a vacuum, so too does local knowledge have its limitations. When local knowledge is combined with science, growth and innovation are more likely to result. Several other points were made within this group, including the importance of mutual respect during a knowledge exchange, the importance of recognizing failures, and the effectiveness of both formal learning exchanges and radio programming to the knowledge exchange process. There are several benefits that should be added to any discussion of knowledge sharing. For example, knowledge is generated when individuals simply get together to exchange ideas and experiences. Awareness of traditional knowledge is a treasure that has been shared globally through academics. However, even though communities may trust academics, the benefits that accrue from research are often not shared with the communities. Thus, there should be a legal framework in place that ensures that benefits are shared with the communities who care for and rely on the local, natural resources. Despite the general lack of information exchange between academics and local communities, other Taba participants noted cases of mutually beneficial arrangements between indigenous and local communities who harbor traditional knowledge, and academics who have greater access to scientific knowledge. Knowledge ends up being power. Communities have tended to depend on knowledge from outside sources. The sharing of knowledge also leads to success. On the issue of knowledge exchanges, one participant noted that importance of providing correct information and of adopting an open exchange of knowledge. Another participant questioned the objectives associated with knowledge sharing, and stated that they personally view knowledge exchanges as a means to improve the living conditions of marginalized peoples. The application of the knowledge and skills acquired is something that is very important to improving living conditions in impoverished and marginalized communities. Thus, it was noted that future initiatives should focus on the application and implementation of acquired skills. Gladman Chibememe, from CHIEHA in Zimbabwe, stressed the right that local communities have to knowledge and information. Gladman noted that the UN system sometimes utilizes local and traditional knowledge to inform international policies and decisions. Thus, local communities can leverage their knowledge as means to enhance their local communities and contribute to sustainable development via the decision-making process. Esther Mwaura-Muiru (Groots Kenya) re-framed the afternoon discussion by asking Taba participants to identify the characteristics and components they would like to see in a facility that enhanced knowledge sharing. In addition, participants were asked to identify appropriate partners in the facility, and to suggest ways that communities might consistently build on learning arrangements. Input from Taba participants was solicited, in part because the UNDP Equator Initiative may pursue such a venture in the future. Although Esther wanted to groups to go immediately into break out groups to discuss these key points, many Taba participants had questions and comments about the creation of a knowledge sharing facility. One participant wondered whether a single facility could meet the needs of a diverse array of communities, and suggested that some sort of data was necessary in order to more specifically address Esther’s points. Another commented on the need for the sustainable financing of projects, and for more information in order to decide how best to proceed on any specific project. Willian Atu cautioned that peer-learning exchanges may become cumbersome if they are framed within a political system. Willy Kostka asked for more information about the Equator Initiative knowledge program that Esther mentioned. Gladman tried to refocus the discussion on the original key points that were raised by Esther. Specifically, Gladman asked the Taba participants to discuss the gaps that exist in current knowledge programs, as well as any gaps or challenges to the improvement or implementation of a given knowledge facility. Esther added that it is important to reflect on how much has been invested in community initiatives, and then evaluate what inputs are necessary. Barbara Schmal, from the Green Life Association of Amazonia (AVIVE), stated that the Taba process of exchanging community information which has been very useful. Barbara suggested that the group move forward to identify what components might be missing in existing knowledge exchange programs, so that a plan of use, management and sharing might be developed. After the end of the breakout session, each group gave a summary of their own discussions. Evelyn Fetridge (Fordham University) reported back for group number one. Evelyn’s group stressed the need for funding and community access to monetary funds. The group also wondered whether the Equator Initiative would fund specific programs and learning exchanges in the future. The importance of local resolution of issues associated with networking between governments and local communities was raised. In addition, vertical and horizontal knowledge sharing were identified as important avenues for knowledge transmission, that can largely be undertaken by the communities themselves. The key topics identified by group two were access to funding and human capacity development. In general, most group members have experienced problems with capacity development. Meetings at local and international levels were considered important venues for sharing experiences and exchanging intellectual capital. There was a discussion on how to include ALL communities, especially for those who do not have access to larger NGOs or universities, in knowledge exchanges. The importance of engaging whole communities, specifically to facilitate a scaling up of their efforts, was mentioned. 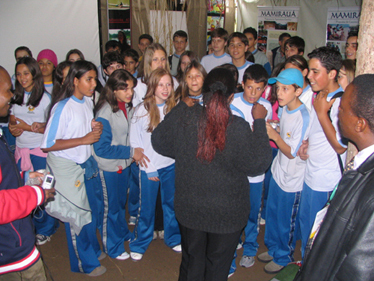 The third group included representatives from the Peru, Bolivia and Chile. Within this group, there was mention of the commonality of government absence from the work of local communities. The state seems to be doing less and less across these nations, and resources are not properly applied. Thus, this group had three major propositions. First, capacity development, especially for young people, should take precedence in local communities. Second, biodiversity, and not government bureaucracy, should be the main issue. Government bureaucracy is harming the work of local peoples (via health regulations and other barriers to traditional life) and is commercializing their work. Finally, communities must take an active role in fighting corruption at all levels. The afternoon session closed with Adalbert Eledui (Director, Department of Conservation and Law Enforcement, Palau) cautioning local community leaders to be wary of the intentions of NGOs, academics and other outsiders that might approach them with a specific project.